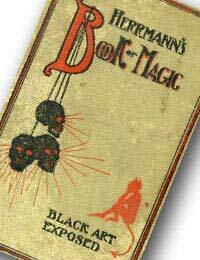 Alexander was not the first Herrmann to don the hat and gloves of a magician, nor was he the last. But he was, perhaps, the greatest - certainly the most well known. In fact he was billed as Herrmann the Great for much of his professionally career, and even when his nephew Leon tried to usurp that title after his death it did not matter. The world, and American in particular, knew that Alexander Herrmann was a magician without peer. It all started with a Doctor named Samual Herrmann who dabbled in slight of hand, amusing his rich patrons in Europe. His oldest son, Compars, disobeyed his wishes when he chose performing magic over learning medicine for a career, and Compars was the first famous Herrmann magician in Europe. His devilish beard added to his appeal, and his skills as a performing magician were great. Soon Alexander, Compar's younger brother by sixteen years, was used in his older brother's act. The magic bug big Alexander hard, and it wasn't long before he left home to live with and train under Compars, much to the chagrin of the father. They performed together for years until, at the age of 18, Alexander left to tour Europe when Compars toured America. Soon Compars was to retire, and Alexander came to the United States a much polished and talented magician. He became THE Herrmann performing magic in the States, and his principle rival of the time was Harry Kellar. The two were know for their public rivalry, each competing hard to out do the other. When one would add a new wonder to the act, the other would spy and try to figure out the secrets, and then add an inspired version to their own act. They even went after the same helpers, such as Billy Robinson, the American magician who perfected the art of Black Magic and later went on to become Ching Ling Soo. Robinson, first hired by Herrmann, later left to work for Kellar. Alexander met and married Adelaide, who became an indispensable part of the act. In time his nephew Leon joined them and was groomed to be Alexander's successor, as the magician had no children of his own. Alexander Herrmann lived expansively, using a private rail car to travel and the owner of serval homes and yachts. He was known for his fun and impulsive slight of hand, pulling a roll of money out of the Mayor of New York's beard when the later performed his wedding ceremony. Unfortunately when he died he left his estate in a lot of debt, and his widow was forced to continue work. She contacted Leon and they resurrected the Herrmann show, but was wroth when he left and started calling himself "Herrmann the Great." It is interesting to note that, when Leon died young, the only Herrmann not born into the name to was left to carry on. Adelaide Herrmann performed well into her 70's, longer than any man of the name, with a magic show that was the talk of the land and a critical success.